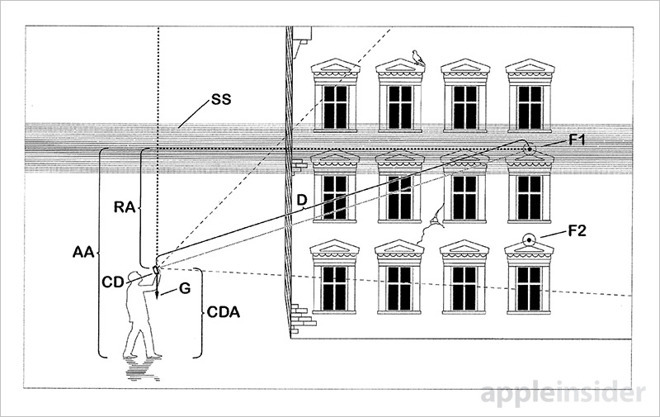 Apple was granted a pair of patents on Tuesday that depict a mobile augmented reality system that can detect objects in the surrounding environment and overlay them with virtual information. 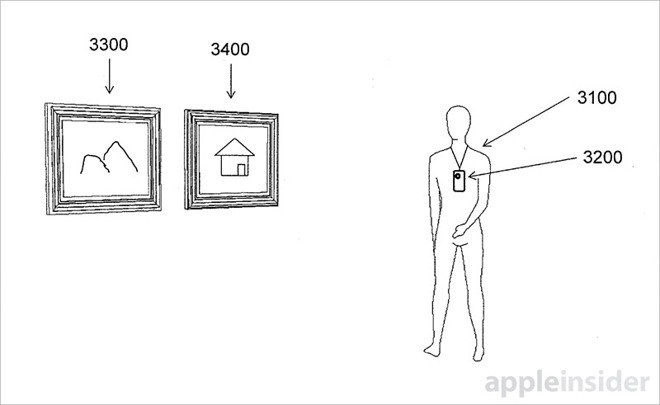 Picked up by AppleInsider, the first patent published by the U.S. Patent and Trademark Office is titled "Wearable information system having at least one camera" and describes an AR device with intelligent object recognition capabilities. Combining cameras, a screen, and a user interface, the device is described as being ideal for a head-mounted display, but the patent also suggests a use for the system in future smartphones, owing to the power efficient way in which it monitors the environment. The device is described as having a default low-power scanning mode for normal operation, with high-power modes activated for short periods – when downloading and displaying AR content, for example. The rest of the patent gets quite technical as it details methods of optical tracking and determining camera orientation, two areas of AR that will prove particularly difficult to perfect. Detecting, matching, and describing environmental features quickly and accurately are two challenges that Apple suggests could be overcome using a combination of dedicated hardware and pre-learned data. One aspect of such a system would use depth detection, achieved via dual-lens cameras similar to those found in the iPhone 7 Plus, which also utilizes depth mapping algorithms to produce Portrait Mode photos. The second patent, titled "Method for representing virtual information in a real environment", details a way of labeling points in a topological real-world space while taking in environmental features such as object occlusion as the user moves around. In one example, a user views an AR city map on a transparent display – or on a smartphone screen feeding a live image from a rear-facing camera – and pulls up information relating to nearby buildings or landmarks. The patent goes on to suggest using geometry models, depth-sensing, positioning data and other advanced technologies to compensate for shortcomings in current visual modeling systems. The second patent also relies on a dual-camera system for creating a depth map of the immediate environment onto which the virtual data is superimposed. The described technologies may or may not appear in future Apple products, but it's worth noting that both patents were originally filed for by German AR specialist Metaio just before Apple acquired the firm in 2015. Existing staff would have likely joined Apple's team dedicated to AR/VR research, to help explore how the technologies can be incorporated into future products. Several times over the last year, Tim Cook has spoken of Apple's deep interest in augmented reality. "AR can be really great. We have been and continue to invest a lot in this. We're high on AR in the long run," he said in July. Why is the dude in the first graphic touching himself.